Today I’m delighted to take part in the blog tour for Mike Hodges’ Bait, Grist and Security, three darkly comic noir novellas from the cult director of Get Carter. More on the book later, but first I’ve got an extract from chapter one of BAIT. Winter is the only time to be in this place. On a wet night preferably. The dark sea, flattened by rain, laps against the long curving beach. White-painted iron railings and ill-lit weather shelters recede into the mist. An amusement arcade, boarded up, sits like a blind man watching nothing. The Grand Atlantic Hotel, a vast, corroding edifice, looms over the deserted esplanade. A torn canvas banner flaps over its darkened entrance, announcing the presence of the Brotherhood of Magicians Conference. Bedroom windows stacked up to the murky sky are black patches. The magicians are long in bed. They’ll need steady hands in the morning. The clock tower strikes on the hour. An approaching motorbike cuts through the sound of rainwater smacking the tarmac. The red Yamaha rounds a corner slowly, ominously, powerful as a shark. A metallic titanium flip-front helmet glints under the street lamps. Moulded gloves with visor wipes, grinder boots, cowhide jeans and a leather jacket embossed with a bloody knife embedded in the rider’s back. The rider steers his machine along the esplanade before circling a traffic island housing the public urinals, all the while scanning the empty street. A municipal shelter with a noticeboard advertising local events for wet winter nights stands beside the amusement arcade. It’s here the bike comes to rest. The rider leaves the engine running as he nervously pulls posters from a saddlebag. Soon the forthcoming amateur operatic production of Annie Get Your Gun is no longer forthcoming. But ‘The Personal Improvement Institute: A Course in Leadership Dynamics’ is. The etched face of a wild-eyed mountaineer intending to give a slide lecture the very next evening is replaced by the well-fed features of Dr Hermann P. Temple, who will show you the QUICK way to the TOP! during his impending weekend course on SUCCESS-POWER GETTING! A similar fate is accorded ‘Pinkie and Barrie, the Comedy Duo’; ‘Diana Barnham playing Bach on the Clavichord’; and the providers of ‘Merrie England Banquets. Book now to avoid disappointment.’ All disappear within seconds to be replaced by five identical images of Dr Temple. A quintet of pointing forefingers, quiffs and eyes that would make a cobra back off. A solitary light snaps on. The block housing Mark Miles’ office is just that: a block. It has all the charm of a coal bunker. Built in the sixties, it’s an early example of how easily even smart people can be conned. Concrete is beautiful. Or so the architects decreed at the time. Providence House, for that’s the block’s portentous name, takes on a gloomy appearance in the torrential rain. Mark Miles appears at the window, taking off his helmet, while simultaneously dropping the slatted blind. One side falls faster than the other, which doesn’t happen in movies, but almost always does in real life. Cursing, he tries to level it off, one-handed. Instead it becomes uncoupled and collapses on top of him. Mark Miles and his blind have one quality in common. Both spend their lives dangling. Mark is sick of being a small fish in a small pond. His only remaining heroes are the sharks in the local aquarium. These massive glistening predators eye the awed visitors on the other side of the glass with contempt as they sweep majestically past in their eternal search for a way out. Like them, Mark wants to command respect. To this end, his pinball mind has been hyperactive since being approached by Dr Temple’s people to promote his weekend course. Leadership dynamics might just be the metamorphosis needed to take him to the top. He switches on a battered desk lamp, puts it on the floor and kills the overhead. Mark has to be careful. The landlord suspects that, contrary to the terms of his lease, the office also doubles as his living quarters. That’s why the chipped commode with ‘Hospital Property’ boldly stencilled on its lid, and smuggled in under cover of darkness from his late grandma’s council flat, is disguised with a potted palm. He lifts the palm and urinates into the china basin. – was wont to ambush him on his early-morning run along the corridor to the communal lavatory. After several narrow escapes, Mark devised a strategy whereby he transferred the contents of the commode into a plastic first-aid box before embarking upon this essential mission. These words always play on Snipe’s retreating figure. Mark now eases out a crumpled futon and sleeping bag from under the defeated sofa, carefully avoiding any tangling with its bare springs. Rolling back and forth on the floor, he sheds his clothes and slips into the kapok envelope. In the street below Mark’s office, a black umbrella is opened from the shelter of a shop door. A man, short and paunchy, steps out, his suet- pudding face glistening in the rain. His name is William Snazell and he’s a private detective, a gumshoe. Dressed in a faded raincoat and shapeless trilby, he takes a final look at the darkened window before crossing the road. His shiny rubber galoshes shuffle through the sheet of rainwater. 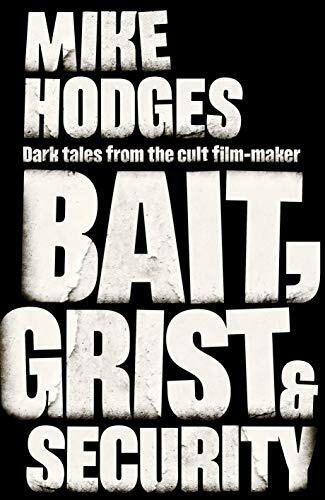 Bait, Grist & Security by Mike Hodges is published by Unbound on 29th November 2018. Many thanks to Anne Cater and Unbound for the review copy. In ‘Security’, an American movie star, unhappy with the film he’s working on, refuses to leave his hotel for the studios, while in the corridor outside his luxury suite mayhem and murder take over.